The humorous reaction probably shouldn’t come as a surprise. After all, before leaving the newspaper business to write novels full time, Barclay was a humor columnist for the Toronto Star, Canada’s largest newspaper. And his first novels, the Zack Walker series, were hailed as the funniest crime fiction around. But it wasn’t his more comedic side that led to breakout success. In 2008, Barclay’s standalone thriller, No Time for Goodbye, shot to number one in the UK and stayed there for the entire year. It was a validation for Barclay, one that “remains one of the high points of my career,” he said. The book’s success also convinced Barclay that it was time to leave the newspaper job he loved to focus on fiction. Today, Barclay is a New York Times and international bestselling author. He includes in his fan base none other than Stephen King, and his books have been repeatedly optioned and adapted for the screen. His latest, FAR FROM TRUE, the second entry in his Promise Falls trilogy, is already an international bestseller. “FAR FROM TRUE kicks off with a bizarre collapse of a drive-in movie theater screen that leaves several people dead,” Barclay said. “One of the victims also had his home broken into. Private detective Cal Weaver is hired to see what’s been stolen. But it’s not what’s missing that catches his attention, but what he finds.” The story tracks Weaver and other familiar faces from Barclay’s prior books set in the creepy upstate New York hamlet of Promise Falls. Make no mistake, Barclay’s success did not come overnight. In his twenties he wrote novels. His college thesis even focused on the classic mystery story: “The Private Eye as an Iconic Character in Literature.” And he describes one of the best nights of his life as the time when he was twenty-one and had dinner with the late writer, Ross Macdonald. “If you were a baseball fan, it would be comparable to having dinner with Mickey Mantle,” he said. Macdonald even offered feedback on young Barclay’s manuscript. But it would be years—more than two decades as a newsman—before a novel would be ready for publication. Barclay readily jokes about past failures before and after he became a bestseller, but one senses that his long road to publication has given him an appreciation for his job, and an excitement about every new book. FAR FROM TRUE is no exception. 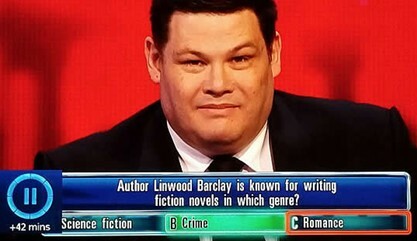 So, sorry quiz-show-contestant-guy, but the answer is “B”— Barclay is a crime writer. And a damn good one. 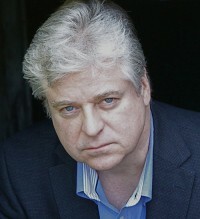 Linwood Barclay is the #1 internationally bestselling author of thirteen novels, including Trust Your Eyes, A Tap on the Window, No Time for Goodbye and that novel’s followup, No Safe House. 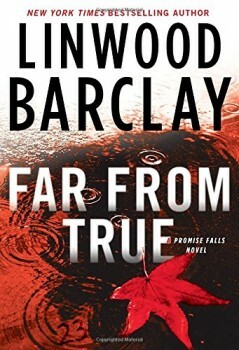 Over the years, several of Barclay’s novels have been optioned for film and television. Most recently, No Time for Goodbye has been optioned for television in France, and in 2012, Trust Your Eyes was the object of a film rights bidding war between Universal and Warner Bros. His first standalone thriller, No Time for Goodbye, was published in 2007 to critical acclaim and great international success. The following year, it was a Richard and Judy Summer Read selection in the UK, and did seven straight weeks at #1 on the UK bestseller list. The book has been sold around the world and been translated into nearly thirty languages. To learn more about Linwood, please visit his website.